Automation is the name of the game these days for web apps, and Wappwolf aims to combine automation with the power of cloud computing. Available for Dropbox, Google Drive and Box, Wappwolf offers on-the-fly file conversion, as well as automatically moving the files to other folders, email notifications, tweets, FTP uploading and more. And once you've set the rule, everything gets done behind the scenes. To begin using Wappwolf, log in using your Dropbox credentials and a special Wappwolf folder will be created in your Dropbox account. Alhough some options are paid premium features, there is still plenty for the free basic user to get their teeth into. Free basic users can have a maximum of 10 automations, and 100 files at 100MB a day. But if you pay $5 a month, you get unlimited automation, and 1,000 files at 1,000MB a day. Before you do anything else, you first need to go to the Wappwolf website and choose which cloud service you plan to use with the service. 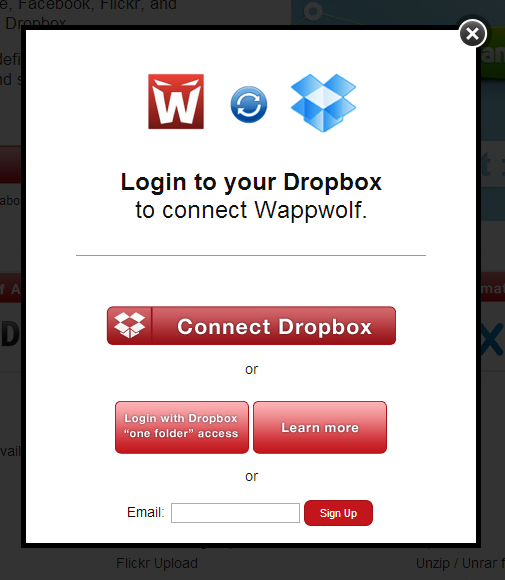 You will then have to log into Wappwolf using your cloud computing credentials. In case giving Wappwolf the entire run of your cloud computing account gives you the creeps, you can instead restrict its access to just one folder in your account. And of course it goes without saying that you can revoke Wappwolf's access to your cloud computing account at any time. 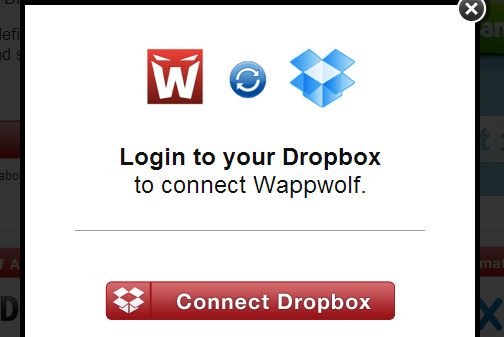 Once you have successfully logged in, a special Wappwolf folder will be made in your cloud account. This is where all of the action will take place. When you make an automation rule, you can choose to make sub-folders for each rule, so don't worry about things getting really messy in there. 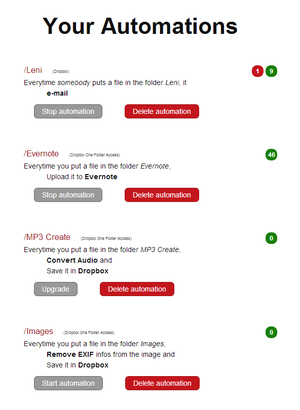 To start, simply click on "create a new automation" and you will be asked to choose a folder (or create a new one). When you put a file into this folder, then the automated conversion and action will happen based on the next step of the rule. Every time you create a rule, it will appear on your list of automations, with the ability to delete that rule and upgrade to a paid plan for more options. To set up that part of the rule, you are presented with all of the automation options...and there are a lot. The sections are Documents, Pictures, Audio, Video, Any File, Send Info and Advanced. So if the automation is called "Convert to Kindle" then you would go to the Documents section to set up the next part of the rule. You would click on "send it to your Kindle", whereupon you can specify the file format and your Kindle email address. If the automation was called "Convert to JPG" then the Pictures section would be your next port of call, where you choose what you want done to the image. Same with audio and video. Choose the action you want carried out. You get the idea. It's not difficult at all, and of course anything you do can easily be deleted and redone. So it doesn't hurt to play around with the options and see what you come up with. "Any File" is particularly interesting as it provides a wide range of options, including emailing the file, encrypting / decrypting it, zipping / unzipping it, or uploading it to another cloud service. You can even set up file folders to automatically send out tweets, set Facebook statuses, or generate a Goo.gl short URL. To pay for the premium service, you would have to be a very keen automator and converter: I found 10 automations to be more than enough. And the conversion features which are paid, such as MP3 conversion, can easily be done by free alternatives (albeit without the file automation that Wappwolf also offers). I would be interested to hear from you in the comments whether you think this is a better conversion service than some of the competing services out there. Is the automation part of the service the extra icing on the cake or something which is nice but ultimately unnecessary? Wappwolf automatically converts and syncs files, then places in a pre-defined folder.